After a long and interesting discussion with other member of the BarCamp Nashville 08 organizers at the post un-con un-dinner un-get together, we decided the fate of just how to handle future non-profit events. 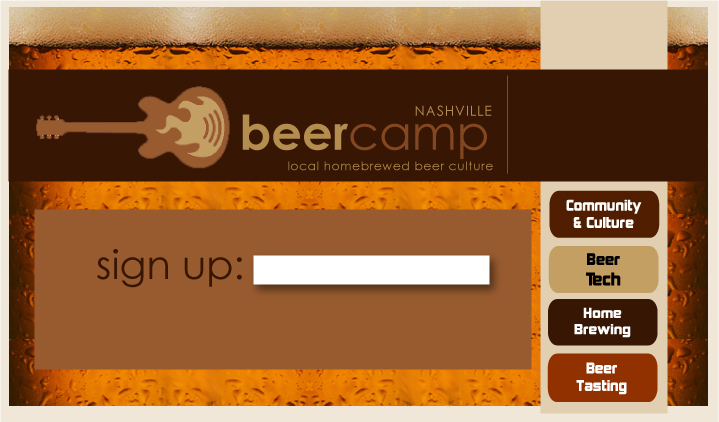 Now part of this discussion had to do with off-shoots of the “Camp” events, such as the one I had pitched earlier in the week devoted to homegrown brewing… BeerCamp Nashville. The short of it is, it’s not going to happen. The slightly longer version is that after talking with folks that night and hearing Dave Delaney’s thoughts on the subject, I’m not so sure there really need to be a separate “Camp” for beer. I say that with full understanding that the response I got to hold an event like that were phenomenal. I got at least 50 responses via twitter and a handful through e-mail. I learned that there is a local homemade brewing culture in Nashville and honestly, they’d like to see an event large enough to foster education and discussion of craft beer. The interest is certainly there, but the BarCamp mythos is one of technology and by venturing into very non technical fields (such as beer, and man I did try to interject the tech) you risk diluting the whole spirit of the unconference. It’s that and my heart just isn’t in it enough to stage an entire event for a subject that I know very little about. But with that being said, I very much want to see something like this happen. It’s part of the reason why I said something about BeerCamp in the first place. So if someone else wants to pick up the leader stick and run with it, I’m totally cool and will help in any way I can. Local fish culture. Need I say more? Probably not but I’m going to anyways. This unconference is for lovers of fish and by that I mean if you love the entree of fish then come. If you happen to be a strict vegan, that’s cool bring your pet goldfish Goldie and demonize your fellow neighbors. Probably the greatest of all musicians, Rick Astley, evokes a universal appeal. This camp, which I hear is already going forward, would celebrate Rick and his rich history of never letting us down. Ever. He means that too. Never. This one actually begins as soon as you stop reading my blog. An event where local folks come together to talk about Camp culture, how to start a new camp, how to exploit it, make money off of it…etc. It seemed like the most natural thing to do for all us BCN08 organizers. Sadly, no one else actually shares this sentiment. An event to celebrate the culture of Canadian folks named Dave. Why Canadian people only? Well because that country has several wild Yetti roaming the white tundra while we only have one big foot (lame). Also because I didn’t think it was possible to love ham anymore than I already do but the Canadians found a way: Call it Bacon. Brilliant. I’m really sad this one isn’t going to happen because it means no free iPod accessories and no interesting discussion from Canadian Daves living in Nashville. This entry was posted on Monday, November 17th, 2008 at 3:01 am and is filed under Side Projects, Social Media. You can follow any responses to this entry through the RSS 2.0 feed. You can leave a response, or trackback from your own site. Tom, good form. This actually makes sense. It sounds like you guys are just being honest about what you have time to focus on. If we had more honesty in our discussions about what we think is realistic, rather than always encouraging people to shoot for the stars, I imagine fewer things, but more meaningful things will happen. Also this talk of Camp this and Camp that. Perhaps a camping trip is in order this Spring. Perhaps decamping from this campy theme is in order and we can confabulate about media conspiracy memes.